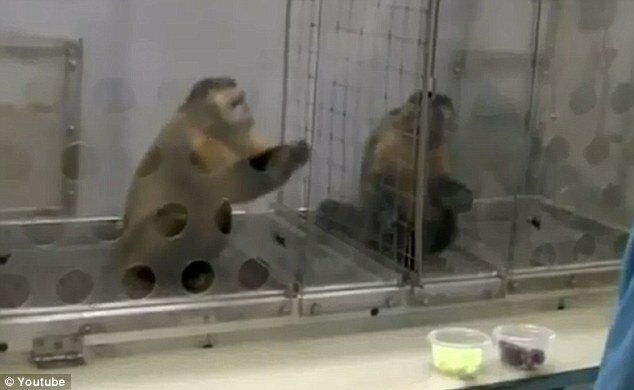 This monkey experiment demonstrates how primates react to unequal pay. Read on and see how they show sense of fairness. In a groundbreaking behavioural experiment conducted by primatologist Frans de Waal, two capuchin monkeys were given a simple task and rewarded on the basis of it. The first round was relatively simple. The monkeys only had to hand over a few rocks from the pile in their cage to the assistant. When they successfully completed the task, they were given a piece of cucumber. As long as both monkeys were rewarded equally, they were perfectly satisfied with receiving cucumbers as a reward. This is when the researchers introduced a little twist to the perfectly structured task-reward system. When the monkey on the right is given a grape instead of cucumber, the partner on the left notices. She does not protest just yet, cautiously carrying out a test of her own. Accepting the first piece of cucumber, she waits patiently to see how her partner is rewarded. Sure enough, when she receives the grape again, the outrage begins. She flings back the piece of cucumber at the assistant, demanding – in typical primate fashion – to re-evaluate our concept of fairness and inequality. Philosophers over the years have heatedly denied that the pillars of morality are an entirely human construct. Consequently, they reasoned, morality cannot exist when the capacity for rhetoric is absent. Social experiments such as this have proved that claim to be false and reeking of bias. As of now, there is ample evidence that moral behaviour is not limited to the domain of humanity. Qualities of fairness, empathy, reciprocity and even empathy can be seen explicitly demonstrated by primates and other species. This Man Is One Among The 10 People That Still Live Within The Confines Of An Iron Lung!